This tiny bisque fully jointed doll just 2" long has a beautiful little painted face with bright blue eyes, rosy cheeks, blond hair and even blond eyebrows. She is covered with a tan satin with an embroidered edge done in yellow floss. She is a needle keep with a pincushion at the end that acts like a pillow for her when it is folded up. 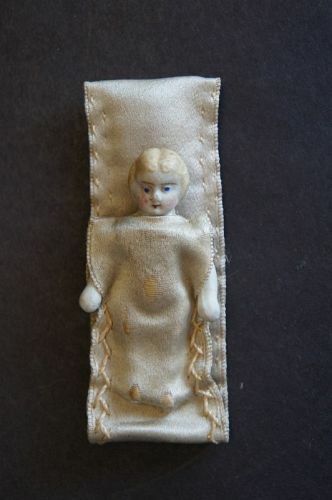 The sewing roll is 6" long including the doll and is 1 1/4" wide. The satin is wearing where her body and feet are but it hasn't broken through. She is a very nice little sewing item from the late 1800's.